Are you preparing for your next teacher job interview? Or, are you interviewing for any other education position? You have come to the right page. Search the abundance of information on interviewing to land a teaching job. If you look to the side bar there are many articles related to interviews. 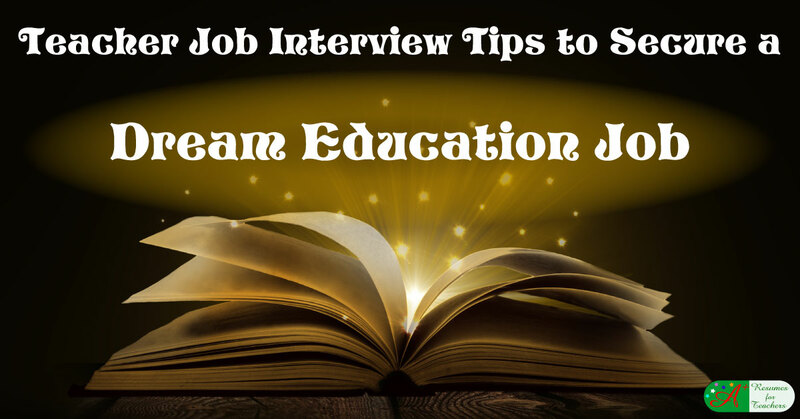 Over at the blog we have posts on education job interview tips to help with ever step of the interview. Congratulations, you've landed an interview for the job of your dreams! But now what? You think you're prepared, but are you really? Do you know what a Behavioral Descriptive Interview is? Do you know how to handle a Panel Interview? Do you know how to communicate your relevant accomplishments? Do you know how to highlight your credentials and expertise without coming across as arrogant? Do you know what interviewers are truly looking for? Do you know what to do when faced with an "unethical" or "uncomfortable" interview question? Do you know proper etiquette when facing questions concerning salary and benefits? Do you know how to write a Thank You Letter post interview? If you answered No to any of the questions above, then you need to keep reading! A job interview is not just something you do; it's not simply a part of life. A job interview is a chance at accomplishing your dreams! It's the first step on the road to success! Though it may seem silly, it is an excellent idea to practice for your interview in front of a mirror and talk out loud as if you are in a job interview. By visually observing your posture and mannerisms, you will be able to recognize and correct anything that may seem out of place or unprofessional. You will get a true sense of what you look like to the interviewer. Once you have perfected the physical aspects of your interview technique, you will feel more confident in yourself when speaking with the principal or superintendent. Rehearsing with a friend is like practicing in front of the mirror, but with an added bonus of someone you trust giving you an honest critique of how you look and sound. Have your friend ask you a list of potential questions and pretend you are actually in the interview — act and speak as though you are addressing a principal or superintendent. Take your friend's constructive criticism seriously and do what you can to remedy anything seen as negative or unprofessional. A little practice goes a long way! Bring a portfolio to the interview. A portfolio is to develop a comprehensive collection of past projects you have implemented, thematic units you have created, teaching resources you have designed and utilized, etc. Be able to explain what each item is, what the purpose is, and how it has positively impacted student learning. Also explain how these items can help the specific school or district you are interviewing for. Know and incorporate current industry buzzwords. One of the best ways to impress your interviewer is to stay current on education and know and use buzzwords or catch phrases... properly. Furthermore, it is a good idea to remain up-to-date on the latest works in academia and applicable courses. Understanding what the up and coming theories and techniques are can really boost your rank amongst the competition. Schools are always looking for fresh ideas and educators who are willing to learn. Link yourself to the school. This technique will give you a greater chance of gaining the position. The main focus is to give you the opportunity to already place yourself in the position. By asking the right kind of questions, you will give the interviewer the impression that you fit in perfectly. For example, instead of asking, "What kind of in-services and continuing education does your district offer?" ask "Which workshops and in-services will I be able to attend?" This allows you to attach yourself to the district and take pride of ownership in the school. Show how you effectively collaborate with parents. Since parents play a key role in the learning process, particularly with elementary school students, it is imperative that you convey your skills with regard to communicating with families. This is especially so if you are applying for the position of Vice Principal. If disciplinary matters arise, you will most likely have to speak with the parents. Patience, communication, and compassion are all key traits that you will need to have when dealing with students' families. Below you will find many interview tips, including teacher interview questions and answers, confidence building techniques, job search etiquette, and effective follow up. This information has also appeared in our past free bi-weekly newsletters. We know you will find them to be helpful and beneficial at your next job interview. However, why risk blowing the one shot you have at acing your interview? Click here to get the A+ Teachers' Interview Edge and discover 152 powerful potential answers to the most popular interview questions teachers are asked. Maximize your confidence and knowledge at your next interview! Check out our One-On-One Interview Preparation and Career Coaching Service. Contact Candace by email or call toll-free 1-877-738-8052 FREE. You could gain more confidence and be more convincing to ACE the interview. You could have someone to help you dig deep into your career experience to uncover accomplishments and communicate them properly in the job interview. You could have an interview and job search coach who gave you solid, constructive feedback and a plan to execute it to generate job offers. You can have an expert to help you when answering difficult questions asked in panel interviews. You could obtain all these things by contacting Candace! It is THAT EASY to INCREASE YOUR CHANCE OF GETTING JOB OFFERS. What Are Common Questions Asked at a Teaching Interview? Interview Questions – Are You Prepared to Do the Asking? How Can Career Coaching Help with Your Education Career? A+ Teachers' Interview Edge (2nd Edition) contains 152 teacher specific interview questions and potential answers to prepare you for your next education interview. Discover not just what interview questions they'll ask you at your next interview... but also how to answer those questions to ensure you land your dream job! Find out more about A+ Teachers' Interview Edge. A+ Principals' Interview Edge (2nd Edition) contains 152 principal / administrator specific interview questions and potential answers to prepare you for your next interview. In today's competitive marketplace, you need to be fully prepared and nothing will have you more prepared to ace an interview than knowing the questions in advance! Find out more about A+ Principals' Interview Edge.